Free Patriots Training Camp 2014 at Gillette Stadium! Patriots Training Camp is a great way to cheer on the Patriots and watch football at Gillette Stadium this summer for free. The first practice open to the public will be Thursday, July 24, 2014 starting at 9:15 AM. A very popular attraction at training camp is the Patriots Fan Zone with inflatables, skilled competitions, face painting and more, which is perfect for kids! Both the Pats training camp and Fan Zone are free and open to the public with free parking at Gillette Stadium too. The first training camp schedule dates open to the public are 7/24/14 through 7/27/14 at 9:15 AM each day; however, more dates will be added through the summer. 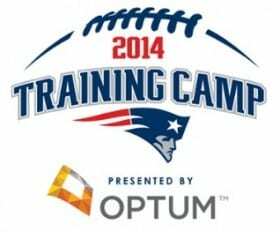 As more dates and times get added through the summer, they will be uploaded to the Patriots Training Camp website. For more information about Patriots Training Camp 2014, please head here. Have you been to Patriots Training Camp before? Go Pats!